George Ruby emigrated from Middlesex, England and found himself tragically caught up in the United States Civil War. A Ruby project member tells the story of George and some of his descendants. The Ruby family that Ruby team member, Corrine Curtis GEDCOM to me (it links into her Sennett ONS) has proved very interesting – George the progenitor was born 02 Sep 1812 in Middlesex, England according to his naturalization petition of 1856. He was a soldier and died in 1863 during the Civil War at the Battle of Fredericksburg [Neither birth or baptism found so far]. George Ruby was a 45 year-old machinist from Taunton, Massachusetts, when he enlisted in that city and was commissioned as a Captain on July 15, 1861. He was mustered on August 24, 1861 into the 18th Mass. Infantry into command of Company B, the Irish Company. He had seen long service as a Sergeant in the British Army and carried a deep sword wound on his face suffered during a campaign in India [I haven’t been able to verify this]. Capt. 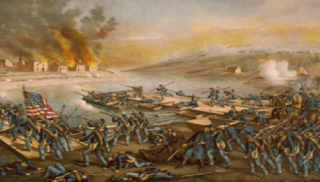 Ruby was engaged with his Regiment in 1862 at the siege of Yorktown, Second Bull Run, Antietam, Shepherdtown, and Fredericksburg. He was killed at Fredericksburg on Dec. 13, 1862, while acting as a Field Officer, however his body was not immediately recovered following the battle and he's buried as an unknown Union soldier as a result. Battle of Fredericksburg. 13 Dec 1862. George had four children: three, James, Daniel and Mary born in Québec and the fourth, Charles, born in Taunton, Massachusetts after the family immigrated into USA from Canada. His children and grandchildren seem to have varied fortunes – Anna or Anastasia, daughter of George’s eldest son James marries a wealthy tobacco manufacturer and ends up living at Hampton Court House, Hampton Court, England (now a school and wedding venue). 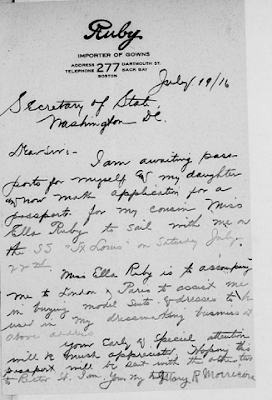 Letter in support of a Passport Application for Ellen Ruby dated Jul 1916 written by Mary R. Morrison née Ruby. Mary Ellen, daughter of James, owned a dress shop in Boston, MA; the shop was called Ruby and what I find interesting is that she is travelling frequently to Paris and London during the First World War to buy gowns. It seems strange to me that the fashion business seemed able to operate at this time. Both her husband William Morrison and her daughter Mary Ruby Morrison travel with her as do other female cousins. 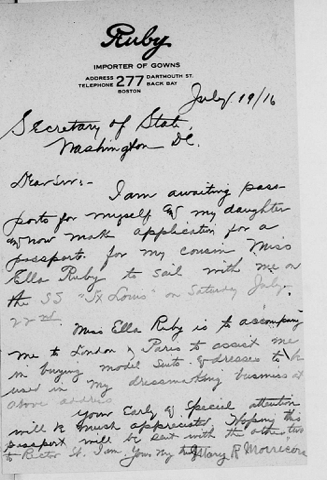 Also they seem to get their passports very quickly, one application on 19 July 1916, accompanied by a letter on headed note paper of Ruby, Importer of Gowns of Boston, to the Secretary of State, Washington – requesting ‘early and special attention’ as they are due to sail on 22 July 1916. I doubt that would work today.